My childhood memories of Thanksgiving include parades, football, and the seemingly endless wait for the turkey to come out of the oven. Roasted turkey is pretty good when it's smothered in gravy and accompanied by cranberry dressing, stuffing, and all the other goodies that Turkey Day entails, but without all those extras it's a little lacking. Enter fried turkey. Unlike oven roasting, which takes about four and a half hours for a 12-pound turkey, deep frying your turkey takes about 4 minutes per pound, meaning that same turkey is done in less than an hour. Better yet, instead of dry meat, you are left with a moist turkey and delicious, golden-fried skin. 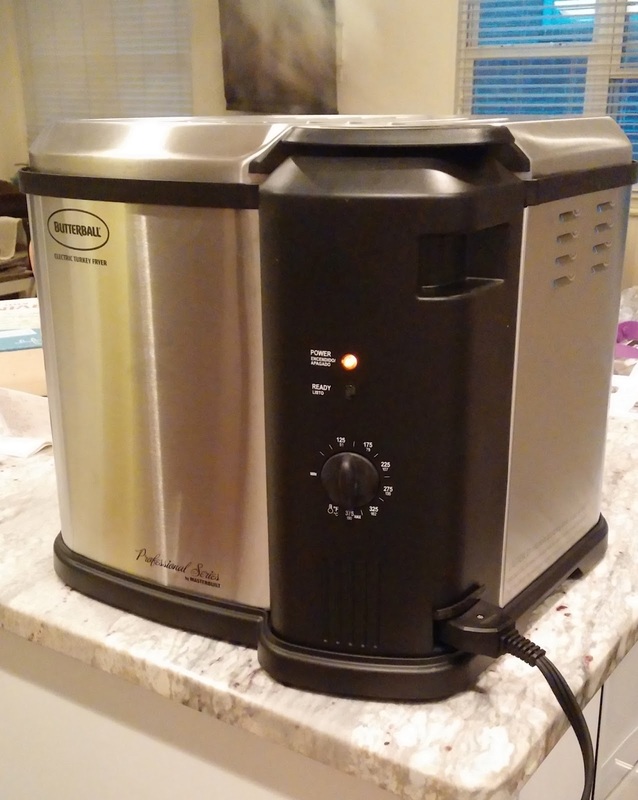 I was lucky enough to try out* the Butterball Electric Turkey Fryer for a pre-Thanksgiving fried turkey rehearsal. Unfortunately the camera ate my pics of the finished product, but I was really impressed by how simple and easy it was to use. Simply fill the fryer with about two gallons of peanut oil, pre-heat the oil for about a half hour (the fryer lets you know when it's ready), and put the turkey--in its metal basket--into the fryer. Just make sure that your turkey is completely thawed before frying unless you want to end up on the local news. I was very impressed with how thoughtfully designed the fryer is. 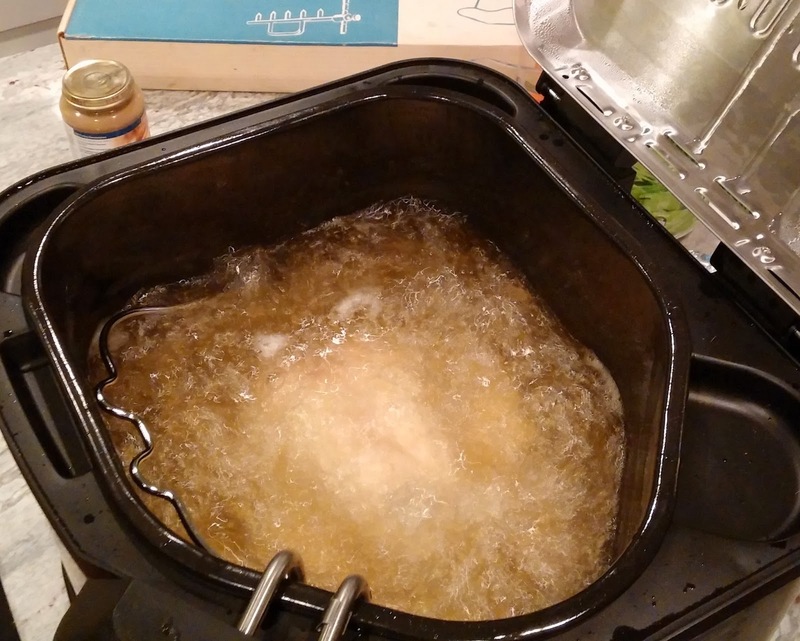 Manufactured by our friends at Masterbuilt, who previously let us take one of their awesome Electric Smokehouses on a test drive, the Butterball Fryer is meant to be used indoors -- I set it up on the kitchen island. The lid keeps splatter contained while letting steam escape. Once the turkey is done cooking, you can lift the basket and attach it to the rim of the fryer above the oil vat so that the turkey can drain and cool without leaving an oily mess behind. Afterward, the drain valve simplified clean-up and made it easy to save the oil for another day (oil has about six hours of cooking life in it - that's a lot of turkey). If you're on the fence about trying a fried turkey, I say just go for it. It's simple, hard to screw up and way faster than oven roasting. Best of all, it's decidedly better tasting! You can get the Butterball Electric Turkey Fryer XL (accommodates up to a 20 lb turkey) in time for Thanksgiving at Amazon via the Adventurous Tastes Amazon Store (buying through our Amazon store helps support this blog - thank you!). Check Costco or your local supermarket for large containers of peanut oil, and don't forget the marinade injector. Happy Thanksgiving! *Thank you to the folks at Masterbuilt for providing the fryer used in this article. While the fryer was free, my enthusiam is 100% real!